The GS110TP is designed for customers who need a low port density solution with the combination of Gigabit speed and PoE capability. The GS110TP comes with 8 dedicated 10/100/1000 Mbps copper ports to connect to your end devices and two additional Gigabit fibre ports for uplinks with greater distance. With PoE capability on all 8 copper ports, the GS110TP can automatically detect PoE on the end devices and dynamically manage power assignments and priority. It is capable of delivering up to 15.4 W of power to devices such as wireless access points, IP phones and IP cameras, providing flexibility and ease of deployment to your network. PoE power management GS110TP offers useful PoE power management features to help you better control and monitor your power resource. The PoE timer can help turn off the PoE ports during certain times of the day so that your network can be more secure as well as energy efficient. It can also set prioritisation on power usage so that specified ports are always guaranteed to get the power first if total power required exceeds the total power budget. The power will be assigned to the PoE ports dynamically depending on the actual power need of the individual network devices so that you don't need to do any calculation. The PoE LED on the front panel will light up if the PoE usage is reaching the threshold, meaning that insufficient PoE resource is left for powering up additional ports. Advanced Quality of Service (QoS) Priority queuing ensures high-priority traffic gets delivered efficiently, even during congestion from high-traffic bursts. Companies implementing network telephony or video conferencing, for example, need to be able to prioritise such voice and video traffic and other real-time applications over less latency-sensitive traffic to ensure reliability and quality. The ability to prioritise traffic ensures quality of latency-sensitive services and applications despite increasing traffic loads. Usability enhancements The GS110TP is a powerful switch, yet very ease to manage. It comes with many usability enhancements to help customers fully utilise the features for a more optimised and secure network. For example, the auto voice VLAN and auto video features will assist customers to easily set up VoIP or IP surveillance networks with a couple of simple steps. You don't need to be an IT professional to set up VoIP or IP surveillance. Security is critical for business networks. However, not everyone knows how to set up a secure network. The ACL wizards on the GS110TP will guide even naïve users through the setup of access control and address filtering. GS716Tv3 GS724Tv4 GS724TPv2 GS748Tv5 Form Factor Rackmount Rackmount Rackmount Rackmount Port Speed Gigabit Gigabit Gigabit Gigabit 100M/1G Copper (RJ-45) Ports 16 24 24 48 1G SFP Fibre Ports 2(dedicated) 2(dedicated) 2(dedicated) 2(dedicated) 2(Combo) PoE/PoE+ Ports (Budget) N/A N/A 24 PoE+ (190W) N/A Switching & Routing L2 Switching L2 Switching L2 Switching, L2+ Static IP routing L2 Switching Power Supply 1 internal PSU, fixed 1 internal PSU, fixed 1 internal PSU, fixed 1 internal PSU, fixed Fans Fanless Fanless 1 internal fan, fixed 1 internal fan, fixed Features VLAN, QoS, Link Aggregation VLAN, QoS, Link Aggregation VLAN, QoS, Link Aggregation VLAN, QoS, Link Aggregation Dimensions (WxDxH) mm 440 x 204 x 43 440 x 204 x 43 440 x 204 x 43 440 x 257 x 43 Buy Buy Buy Buy The GS716Tv3 come with a comprehensive set of features, such as access control lists (ACL), 802.1x port authentication, enhanced QoS, rate limiting and IGMP snooping among others to provide a small and medium-sized business with a network that is geared for growth while ensuring performance and reliability. The GS724TPv2 24-Port Gigabit Switch with PoE+ and 2 SFP Ports joins the NETGEAR Standalone Smart Managed Pro Switches family, adding full 24 port PoE+ support for deployment of modern high-power PoE devices. Cautious spender organisations can now deploy denser PoE+ devices connected to a cost-effective switch, with a reasonable PoE power budget of 190W. NETGEAR Smart Managed Pro Switches offer powerful Layer 2 features, great PoE functionality, and enhanced performance and usability. These switches are the ideal solution even for the most advanced small and medium organisations looking for the best combination of features, performance, and value: they are purposely designed for converged networks where voice, video, data are all carried on a single network platform. The GS724TPv2 24-Port Gigabit Smart Managed Pro Switch provides a great value, with configurable L2 network features like VLANs and PoE operation scheduling, allowing SMB customers to deploy PoE-based VoIP phones and IP surveillance. Advanced features such as Access Control Lists (ACLs), L2/L3/L4 QoS (DiffServ), LACP link aggregation and Spanning Tree will satisfy even the most advanced small business networks. Temperature- and load-based fan-speed control combines accurate monitoring with minimised system acoustic noise: the GS724TPv2 supports quiet rack mounting operation with a maximum of 32.4dB even at full power and 25°C (77°F) ambient. The new standalone GS724TPv2 switch is designed with 24 ports PoE+ and 190W power to meet the current and future needs of wireless converged networks. Within small and medium-sized organizations, there is growing adoption of PoE devices such as VoIP phones, IP security cameras, wireless access points, proximity sensors, LED lighting, door locks, and other IoT devices that require network switches capable of supporting dense PoE installations. Wireless access points and pan-tilt-zoom HD cameras using Wave 2 802.11ac Wi-Fi also require PoE+ power (802.3at), increasing the power demands on PoE switches. “PoE devices are putting a strain on switching power demands.” As a leading provider of network equipment for SMBs, NETGEAR understands the importance of providing great choice of PoE port counts and power budgets that can adapt to the business’s needs, whether in the hospitality, catering, education or retail domains. The GS510TLP 8-Port Gigabit Smart Managed Switch with PoE+ and 2 SFP Ports has 8 ports of PoE+ support for deployment of modern high-power PoE devices. Cautious spender organisations can now deploy denser PoE+ devices connected to a cost-effective switch, with a reasonable PoE power budget of 75W. Fan-less, the GS510TLP supports perfectly silent desktop operation or rack mounting. The NETGEAR ProSAFE PoE+ Gigabit Smart Managed Switches provides a great value, with configurable L2 network features like VLANs and PoE operation scheduling, allowing SMB customers to deploy PoE-based VoIP phones and IP surveillance. Advanced features such as IPv4/IPv6 Layer 3 static routing, DiffServ QoS, LACP link aggregation and Spanning Tree will satisfy even the most advanced small business networks. Organisations who buy infrastructure for the long term and want future proofing for the unforeseeable can require GS510TPP 8-Port Gigabit Smart Managed Switch with PoE+ and 2 SFP Ports: 190W PoE budget offers more headroom. Temperature- and load-based fan-speed control combines accurate monitoring with minimised system acoustic noise: unlike other high power PoE switches on the market, the GS510TPP supports quiet desktop operation or rack mounting with a maximum of 32dB at full power and 25°C (77°F) ambient. The NETGEAR® new generation GS516TP Smart Switch offers powerful L2 and L2+ features, better PoE functions, and enhanced performance and usability. They are purposely designed for the converged networks where voice, video, data are all carried on a single network platform for network efficiency, operational cost savings, and ease of management. The GS516TP is a Smart Switch with PoE/PD features. It can work as PD device that can get power from other PSE device through port 15 or/and port 16. Meanwhile, it can also deliver power to other PDs that are connected to its PoE ports (port 1 to 8). The new generation of Gigabit PoE Smart Switch from NETGEAR is the optimised solution providing the best value at an affordable SMB price point. The NETGEAR® new generation Gigabit 28 port (24 port copper + 4 port fibre) PoE+Smart Switch offers powerful L2 features, better PoE functions, and enhanced performance and usability. The GS728TPv2 comes with PoE capabilities on all ports and supports PoE+ with up to 30W of power budget, providing hardware investment protections so that the switch can support many more PoE powered devices and new higher-powered devices down the road. It is purposely designed for the converged networks where voice, video, data are all carried on a single network platform for network efficiency, operational cost savings, and ease of management. The NETGEAR® new generation Gigabit 28 port (24 port copper + 4 port fibre) high powered PoE+Smart Switch offers powerful L2 features, better PoE functions, and enhanced performance and usability. The GS728TPP comes with 24 PoE+ ports and a total PoE power budget of 384w.It can be used in any deployment with high-density of power-hungry devices, such as multiple 11ac Wireless Access Point, PTZ cameras and Video IP phones.It is purposely designed for the converged networks where voice, video, data are all carried on a single network platform for network eff ciency, operational cost savings, and ease of management. The NETGEAR® new generation Gigabit 28 port (24 port copper + 4 port fibre) high powered PoE+Smart Switch offers powerful L2 features, better PoE functions, and enhanced performance and usability. The GS728TPPv2 comes with 24 PoE+ ports and a total PoE power budget of 384w.It can be used in any deployment with high-density of power-hungry devices, such as multiple 11ac Wireless Access Point, PTZ cameras and Video IP phones.It is purposely designed for the converged networks where voice, video, data are all carried on a single network platform for network eff ciency, operational cost savings, and ease of management. The NETGEAR® new generation Gigabit 52 port (48 port copper + 4 port fibre) high powered PoE+Smart Switch offers powerful L2 features, better PoE functions, and enhanced performance and usability. The GS752TPP comes with 48 PoE+ ports and a total PoE power budget of 760w.It can be used in any deployment with high-density of power-hungry devices, such as multiple 11ac Wireless Access Point, PTZ cameras and Video IP phones.It is purposely designed for the converged networks where voice, video, data are all carried on a single network platform for network eff ciency, operational cost savings, and ease of management. The GS752TSB 52 Port ProSafe® Gigabit Stackable Smart Switch is unique in delivering the scalability, reliability, and performance growing small and medium-sized businesses need in an affordable and easy-to manage package. The NETGEAR Second Generation 52 port switch comes with 48 port copper ports and 6 SFP fibre ports, 2 of which are shared and 4 dedicated for either stacking or uplinks. This new generation of Stackable Smart Switches offers more flexibility and scalability that will make it easier and non-interruptive for growing businesses to expand their network capacity. These Stackable Smart Switches come with a complete suite of advanced features for more robust security, higher quality of service and high availability. 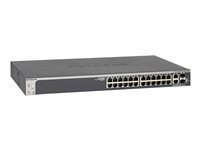 This switch is equipped with highly advanced features such as access control lists (ACL), static routing, rate limiting, IGMP snooping, and Dynamic VLAN assignment among others to provide a small and medium-sized business with a network that is geared for growth and new network applications. Friendly to converged network with voice and video, the Stackable Smart Switches offers auto voice and auto video features that automatically configures QoS, security and VLAN settings for IP phones and IP cameras. In order to accommodate the move by internet service providers to IPv6 addresses, the 2nd Generation of Gigabit Stackable Smart Switches expand the IPv6 support beyond management only to QoS, ACL and multicast. It means that your network will benefit from the IPv6 enhancements and is future-proofed. The GS752TPSB 52 Port PoE ProSafe® Gigabit Stackable Smart Switch is unique in delivering the scalability, reliability, and performance growing small and medium-sized businesses need in an affordable and easy-to manage package. The NETGEAR Second Generation 52 port switch comes with 48 port PoE copper ports with 8 ports supporting PoE+ and 6 SFP fibre ports, 2 of which are shared and 4 dedicated for either stacking or uplinks. This new generation of Stackable Smart Switches offers more flexibility and scalability that will make it easier and non-interruptive for growing businesses to expand their network capacity. The ProSAFE S3300-28X 28 Port Gigabit Stackable Smart Switch is a L2+ web based platform: non-PoE in a 24 port configuration. 4 dedicated 10G ports are included as standard (2 x 10GBase-T and 2 x SFP+) for stacking and/or uplinks to aggregation layers or storage and server connections. The Netgear ProSAFE® S3300-28X is a new generation Gigabit Stackable Smart Switches inclusive of 4 10G ports, which can be used for uplinks and/or stacking between other S3300 switches. Dependable switched LAN network design mandates an architecture that can both scale as organisation networks grow-and be flexible enough to provide support for faster server and storage connections needs. As SMBs produce and consume more data, Gigabit to the desktop increasingly needs to be underpinned with 10GbE connectivity to the core to ensure a consistent, seamless user experience. This new generation of switches provides SMB customers with the most cost-effective 10G connections between the access and aggregation layer of the network. The S3300-28X switch can deliver on demanding tasks such as data replication and backup, video on demand and high volume transaction processing. Up to 6 switches across the series can be stacked for a total of 288 Gigabit access network ports, with 40Gbps stacking bandwidth and full redundancy for unsurpassed reliability. The inclusion of 10GBase-T uplink capability as standard ensures an affordable way to leverage existing copper installations – if Gigabit speeds and link aggregation meets current requirements, simply migrate to 10GbE connectivity at a pace and time to suit your needs. With lifetime warranty, lifetime NBD and lifetime online technical chat to back you up, you’ll have access to an extensive support service to help protect your investment and reduce downtime risk over the long term. The ProSAFE S3300-28X-PoE+ Gigabit Stackable Smart Switch is a L2+ web based platform : PoE+ in a 24 port configuration. 4 dedicated 10G ports are included as standard (2 x 10GBase-T and 2 x SFP+) for stacking and/or uplinks to aggregation layers or storage and server connections. PoE/PoE+ support between 195W to 740W with RPS. 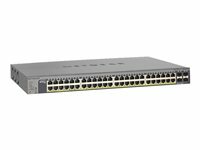 The Netgear ProSAFE® S3300-28X-PoE+ is a new generation Gigabit Stackable Smart Switch inclusive of 4 10G ports, which can be used for uplinks and/or stacking between other S3300 switches. Dependable switched LAN network design mandates an architecture that can both scale as organisation networks grow-and be flexible enough to provide support for faster server and storage connections needs. As SMBs produce and consume more data, Gigabit to the desktop increasingly needs to be underpinned with 10GbE connectivity to the core to ensure a consistent, seamless user experience. This new generation of switches provides SMB customers with the most cost-effective 10G connections between the access and aggregation layer of the network. 2 dedicated 10GBase-T Copper ports supporting 10G/1G/100M speeds The S3300-28X switch can deliver on demanding tasks such as data replication and backup, video on demand and high volume transaction processing. 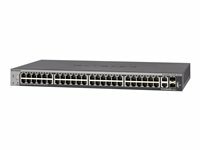 Up to 6 switches across the series can be stacked for a total of 288 Gigabit access network ports, with 40Gbps stacking bandwidth and full redundancy for unsurpassed reliability. The inclusion of 10GBase-T uplink capability as standard ensures an affordable way to leverage existing copper installations – if Gigabit speeds and link aggregation meets current requirements, simply migrate to 10GbE connectivity at a pace and time to suit your needs. With lifetime warranty, lifetime NBD and lifetime online technical chat to back you up, you’ll have access to an extensive support service to help protect your investment and reduce downtime risk over the long term. The ProSAFE S3300-52X 52 Port Gigabit Stackable Smart Switch is a L2+ web based platform: non-PoE in a 48 port configuration. 4 dedicated 10G ports are included as standard (2 x 10GBase-T and 2 x SFP+) for stacking and/or uplinks to aggregation layers or storage and server connections. The Netgear ProSAFE® S3300-52X is a new generation Gigabit Stackable Smart Switches inclusive of 4 10G ports, which can be used for uplinks and/or stacking between other S3300 switches. Dependable switched LAN network design mandates an architecture that can both scale as organisation networks grow-and be flexible enough to provide support for faster server and storage connections needs. As SMBs produce and consume more data, Gigabit to the desktop increasingly needs to be underpinned with 10GbE connectivity to the core to ensure a consistent, seamless user experience. This new generation of switches provides SMB customers with the most cost-effective 10G connections between the access and aggregation layer of the network. The ProSAFE S3300-52X-PoE+ Gigabit Stackable Smart Switch is a L2+ web based platform : PoE+ in a 48 port configuration. 4 dedicated 10G ports are included as standard (2 x 10GBase-T and 2 x SFP+) for stacking and/or uplinks to aggregation layers or storage and server connections. PoE/PoE+ support between 390W to 1440W with RPS. 2 dedicated 10GBase-T Copper ports supporting 10G/1G/100M speeds The S3300-52X switch can deliver on demanding tasks such as data replication and backup, video on demand and high volume transaction processing. 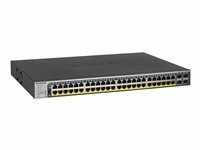 Up to 6 switches across the series can be stacked for a total of 288 Gigabit access network ports, with 40Gbps stacking bandwidth and full redundancy for unsurpassed reliability. The inclusion of 10GBase-T uplink capability as standard ensures an affordable way to leverage existing copper installations – if Gigabit speeds and link aggregation meets current requirements, simply migrate to 10GbE connectivity at a pace and time to suit your needs. With lifetime warranty, lifetime NBD and lifetime online technical chat to back you up, you’ll have access to an extensive support service to help protect your investment and reduce downtime risk over the long term. An ideal companion to the rapidly emerging class of 10-gigabit servers, the NETGEAR ProSafe 52-port gigabit stackable smart switch is the smart switch with 10-gigabit connectivity - delivering maximum throughput in SMB networks for demanding tasks such as data replication and backup, virtualization, video on demand and high-volume transaction processing. At less than half the cost of a managed switch, the ProSafe 52-port gigabit smart switch provides 48 gigabit ports for connecting devices to the network, along with four 10 GE SFP+ ports for stacking or uplink to servers. The GS752TXS offers a rich enterprise-class feature set, including advanced traffic management and security, yet can be easily configured and monitored through a web-based graphical user interface.With a rich set of Layer 2 management features, the GS752TXS is efficient, secure and ready for the future. Static routing allows for segmentation of the network, with internal routing through the switch - reserving the router for external traffic routing only, making the entire network more efficient. Dynamic VLAN assignment increases security by imposing consistent policy and user credentials across the network, regardless of where users connect. Support for MLD Snooping greatly increase network efficiency by forwarding multicast traffic to designated hosts only, rather than flooding multicast packets across all ports. The GS752TXS also comes with full IPv6 support, comprehensive security and advanced multicast management.